Doc White is always happy when he is hunting. 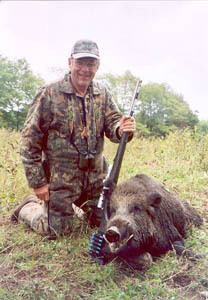 Here, a contented Doc poses with the nice Russian boar just felled from his trusty White 98 rifle. You'll note from the Doc-designed speedloaders on the buttstock, that Doc is always well-prepared for things that can bite back! Doc recognizes sources of his personal inspiration in the firearms development arena, as our talk moves on. RW: Many of us have our personal sources of inspiration, and have a sense both of history and of those individuals who brightly lit the trail before us. In firearms, there have always been two names that instantly command great respect and admiration from me: Paul Mauser, and John M. Browning. What are a few of your personal muses, in the form of designs or individuals that have both intrigued and motivated you? DOC: I have long admired Jean Samuel Pauley, a displaced Swiss who ran a shop on Gunmaker's Row in London. He patented the first in line action in 1812, only 4 years after Forsyth invented the percussion system. He also patented the first breech loading cartridge same year. He was a wild-eyed genius but an abject financial failure, a familiar fault in inventors. The Reverend Forsyth himself has my admiration because of the innovative forward thinking that led to the percussion system. A German, Nikolaus von Dreyse, caught my attention for adapting the common gate closure (the bolt) to a rifle, which led Mauser to the repeating bolt action. Mauser, too, for his industrial genius and not just inventive ability. The same for John Browning, one of the few who have been able to combine inventive and financial genius at the same time. But my real hero is Sir Joseph Whitworth, who invented so many things, techniques, and industries and was so successful in producing them, not only in quantity but in high quality, that he was acknowledged as a genius in his own day. Whitworth was sort of the Edison of the metals industry. They didn’t knight him for nothing. RW: I’m not familiar with Dreyse. It is often mentioned in the literature that it was Scottish immigrant James Paris Lee (1831-1904), as in Lee-Enfield, that is credited with the application of the gate latch to the rifle breech. Is this a bit of history that needs clarification? It is my understanding that when Peter Paul Mauser (with the help of his often neglected brother, Wilhelm Mauser) produced the Mauser Gewehr magazine rifle in 1897, it was Germany’s answer to the French Lebel M1888. DOC: Dreyse worked for Pauley sometime between 1808 and 1814. It was Pauley who first invented the inline with cylindrical hammer and coil spring. In 1838 he patented a turn-bolt (just like the old Roman gate latch) rifle, which became the Prussian needle-gun of 1848. His primer was located on the back of the bullet, with a long firing pin that perforated the paper cartridge and fired the priming pellet. Its advent was devastating for the French. The bolt design led to the Chassepot, Enfield and Mauser, with Paul Mauser bringing out his first turn-bolt, taking advantage of the then new all metallic cartridges, designed by the Frenchman Lefaucheux, as the German model 1871. A tubular magazine was later added in the model 1879/81. Then the first stacked magazine, an improvement on Mannlicher’s single file magazine, in 1891; then the famous Model 95, and then the fabulous Model 98. Parts 1, 2, 4 and 5 of Randy Wakeman's series of interviews with "Doc" White can be found on the Muzzleloader Information Page.